Good snack lovers of the world, today I’m here to introduce you to your favorite new snack – Baked Spinach and Cheese Samosa. We’re talking a delicate thin crispy pastry filled with a creamy cheesy and spinach filling. I bet you won’t be able to stop at just one samosa! A.) The folding technique seems complicated. B.) They usually are a fried snack, and most people do not like frying (me, included). B.) I want really good food, but basically without the effort. Lol. So I went ahead and made a video for this recipe to make the whole samosa folding thing easier for you. As you’ll see in the video, it’s actually not that complicated and with a little bit practice you’ll become a samosa folding ninja. That’s an important life skill, for all of us samosa lovers. Not kidding. Also, for the second issue of frying, I’ve completely omitted that by baking these samosas. Just make sure that you grease the baking sheet with oil (so as to avoid sticking) and also brush the Baked Spinach and Cheese Samosa with egg wash. This will help in giving a golden brown color to the samosas. Now let’s talk a little bit about the filling of the Baked Spinach and Cheese Samosa. Usually, back from where I am, we add spicy meat filling or spicy potato filling to our samosas. 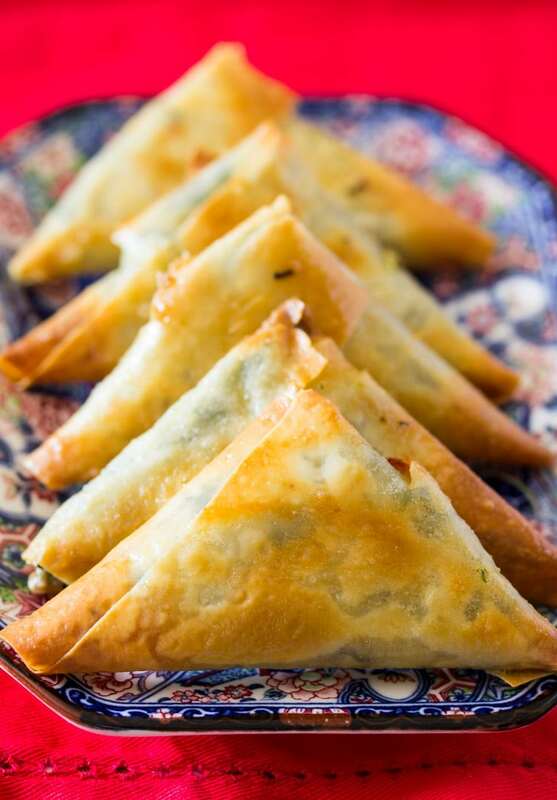 But I wanted to go for something a bit different, and inspired by a Middle Eastern snack I like to have here in Bahrain – Spinach and Ricotta Fatayer, I decided to try a spinach and cheese filling in samosas. And it turned out awesome! Just make sure that the cream cheese you use is at room temperature so that it incorporates fully with the rest of the filling ingredients. Also, I like to add feta cheese because it adds a delicious tangy and salty flavor to the filling. Also, I have a thing for adding unique fillings to my samosas – have you tried my Chocolate Samosa? It’s so delicious too! 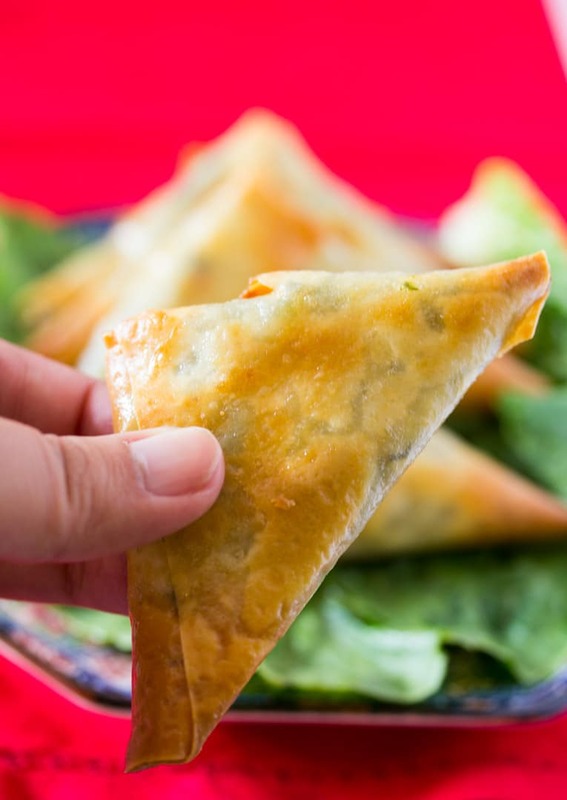 Learn how to make Baked Spinach and Cheese Samosa with an easy to follow video tutorial. A delicious snack that's perfect as an appetizer for parties! In a mixing bowl, combine the cream cheese, feta cheese, spinach, garlic, salt and pepper. Mix until full incorporated. A couple of things to note: make sure the cream cheese is at room temperature so that it is easier to mix it. Also, all excess water should be squeezed out from the spinach. Preheat oven to 400 F / 200 C and prepare a baking sheet by lightly greasing it with oil. Set aside. 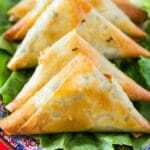 Place a samosa pastry strip vertically on a plate / tray, and start by adding about 1-2 teaspoons of the spinach cheese on the bottom corner. Fold the samosa pastry corner over the samosa filling. Then from the opposite side fold over the corner into the opposite direction. Continue until you have a triangle shaped parcel, and then using your finger to spread the flour / water paste seal over the rectangular flap of the samosa pastry over to completely seal the samosa. Do watch the video for a visual tutorial on how to fold the samosas. Continue until all samosas have been filled. Place prepared samosas on baking sheet and lightly brush each samosa with egg wash on both sides. Bake for about 10-12 minutes or until the samosas are golden brown and crispy. Samosa’s are my all-time favorite food- Drooling over this! Hi. Where do you get samosa pastry strips? Thank you. Just saw your query. I can’t find samosa strips either, but have always used phyllo dough. I make small ones and they are great! Wow… I’ve been lost with the whole samosa thing. My my husband is from India, loves Indian food (why wouldnt he) and I’d really like to master this… you made it so simple … thank you! These look so delicious will have to try them out. Hi, where can I find the Samosa folding video? Wouldn’t this be Greek Spanakopita? Samosas are usually made with a thick fried dough and phyllo is used for spanakopita. Looks delicious! Hi Crissy! 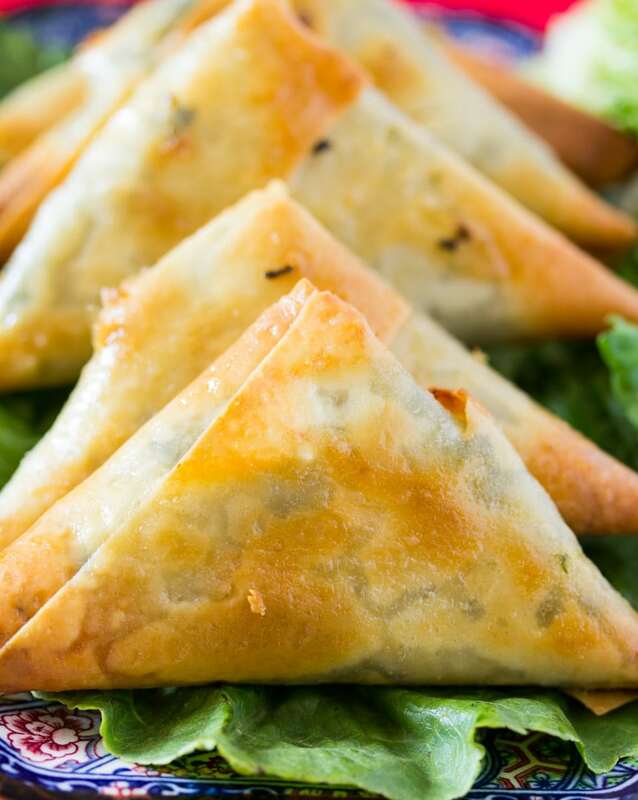 Yes, the filling is similar to Greek Spanakopita, but the samosa pastry has a different texture – it’s crispy and very thin where is phyllo is has more layers and is flaky. This looks delicious. Do you hav a recipe for the strips. I just made these, AND THEY ARE SO ADDICTING!!! I’ve had to force myself to put them away before I ate them all. I added about a teaspoon of lemon zest, and it really pepped up the softer flavors of cheese and spinach. Thanks for the recipe! Thanks for the recipe! Love the tangy and creamy element the cream cheese adds. I diced and fried a small onion with 1/4 tsp cumin, and added a fresh green chilli too. It was delicious! Although next time I think I’ll add more cumin, chilli, garlic, and feta. My pastry sheets were a square size so I cut them into 7cm across strips, so it made about 40-50 samosas. I also baked the first batch and wasn’t a fan of the texture of the pastry so fried the rest – delicious!